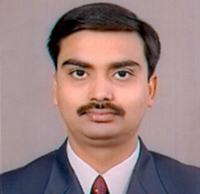 Work Experience : Dr. Sharma has more than 14 years of experience in teaching at institutions of repute such as Institute of Charted Financial Analysts of India, Hyderabad and St. John's College, Agra. He has published his research work in Journals of repute. He has also conducted sessions in Executive Development Workshop organized for the executives of IT Industry. Verma Neha and Sharma Rahul, “Creating Shareholders’ Value utilizing Capital in Post-Merger and Acquisition Scenario: A study in Indian Telecom Industry” Accepted to be published in the International Journal of Management Practice, Vol. 10, No. 1, 2017 (Inderscience). Verma N, & Sharma R (2015). Shareholders Wealth Effects of Mergers and Acquisitions: An Empirical Study of Short-Term Performance in Indian Telecom Industry. LBS Journal of Management & Research, Volume XIII, No.2, (July-December), 29-41. Verma N, & Sharma R (2014). Impact of Mergers & Acquisitions on Firms' Long Term Performance: A Pre & Post Analysis of the Indian Telecom Industry. International Journal of Research in Management and Technology, Vol. No. 4 Issue No. 1, (February), 11-19. Verma N, & Sharma R (2013). Impact of Mergers on Firm’s Performance: An Analysis of the Indian Telecom Industry. Asian Journal of Management Research, Volume 4, Issue 1, (October), 163-175. Goel Sweta., Mani Mukta. and Sharma Rahul, "A Review of Performance Indicators of Mutual Funds", Researchers World - Journal of Arts, Science and commerce, Vol. III, Issue 4(1), October 2012, pp 100-107, ISSN 2231 - 4172. Goel S, Mani M & Sharma R (2012). Investment Style and Performance of Mutual Funds: An Empirical Analysis. International Journal of Business Economics and Management Research, Volume 3, Issue 9 (September), 1-13. Goel S, Sharma R & Mukta M (2012). A study of performance and characteristics of open ended mutual funds. Asian Journal of Management Research, Volume 3, Issue 1, 116-124. Verma N & Sharma R (2012). Impact of Mergers & Acquisition on Financial Performance: With Special Reference to Tata Group. International Journal of Research in Commerce & Management, Volume – III, Issue – VII, (July), 140-143. Sharma R, Mishra J K and Abidi N (2008). Implementation of “IFRS”: Issues and Challenges. Review of Business and Technology Research, Vol. 1, No. 1, 1-8. Goel Sweta, Sharma Rahul and Mukta Mani, “A Study on Performance Related Characteristics of Mutual Funds”, Emerging Issues in Management and Behavioural Science, Dr. Anil Kumar, Dr. Arshdeep and Ms. Kavita Singh, Bharti Publications, Delhi, ISBN 978-93-81212-17-2, 2012, PP147-155. Upadhyay D, Sharma R and Sharma R, “Continuous, Comprehensive Evaluation and Students’ Ability”, National Seminar on Continuous, Comprehensive Evaluation and Grading System held at Dayalbagh Educational Institute (Deemed University), Agra on December 21-22, 2012 organised by Dayalbagh Educational Institute and National Testing Service, CIIL, MHRD, Govt. of India, Mysore. Goel S, Sharma R and Mukta M, “A Study on Performance Related Characteristics of Mutual Funds”, International Conference on Management and Behavioural Science held at Hotel Parkland, New Delhi, organized by Society of Management and Technical Professionals on June 3, 2012. Sinha R, Sharma S and Sharma R, “Exports of Indian Leather and Leather products to European Union (EU) – Challenges and Opportunities”, National Conference held at St. John’s College, Agra on February 25th and 26th, 2005. National Seminar on “Emerging Trends in Financial Services” organized by Institute of Professional Excellence & Management, Ghaziabad on November 3, 2007. 6th National HRM Summit organized by All India Management Association during October 19-20, 2007 at New Delhi.